(Page 12) “It is useful to note that the Finance Commission as envisaged in the Constitution does not prohibit its continuous functioning except that it has to be re-constituted before the expiry of every 5 years.” There is a need for recourse mechanism for mid-term correction, similar to Australian Model of continuous Grants Commission ‘state relativities’ are revisited every years based on latest available data. If macro parameters go along should the tyranny of the Finance Commission be inflicted on the States for 5 years before any relief can be corrected? After all, all awards of the Finance Commission are based on realistic assumptions on what is acceptable macro-economic model in terms of key parameters like revenue projections, State GDP growth, permissible expenditure growth etc. 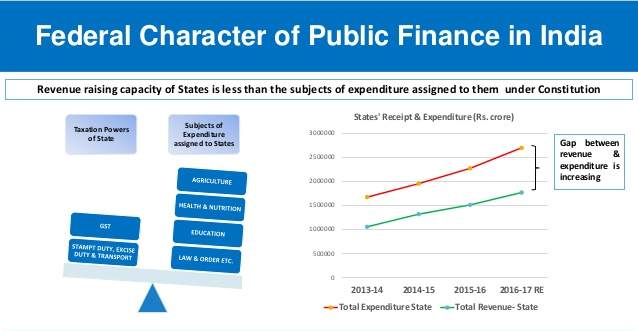 Indeed in our visits to many States we did encounter that in some States the revenue projections were unrealistic, the expenditure suppression was unacceptable and the State GDP numbers look quite misaligned. So what is the recourse mechanism for States or Union may have in case it is found that in the vertical devolution there are also lacunae of one kind or another. Should that wait for a 5 year correction or should there be midterm recourse. Indeed on Page 14 in the book para 4 last line it says “ from the 4th Finance Commission the TOR in the presidential order appointing the Commission excluded the consideration of the Plan requirements of the State by the Finance Commission, and the Planning Commission became an important parallel channel of transfers.” Several Finance Commissions in the past have lamented at their constitutional role being circumscribed in being excluded from the consideration of the Plan requirements. Now that the Planning Commission does not exist and this remorse cannot be expressed what is the institutional mechanism which can make up the lament of the past. This inhibition of the Finance Commission in the plan requirements of the States does not exist anymore, particularly since the NITI Aayog itself, in the words of the authors at page 16, has more of an advisory mandate. Altering the role of the NITI Aayog, policy makers would be mindful of the need of not to create a Planning Commission version 2.0 since it was a conscious decision not to accord resource allocation powers to NITI Aayog. Should one not be careful of creating another parallel financial transfer mechanism? Centrally Sponsored Schemes (CSS) were first initiated even before the First Plan started and during the period of interim Finance Commission by giving central grants for a scheme like Grow More Food Scheme. In the First Five Year plan, many schemes in the states’ domain were funded through central grants like Damodar Valley, Bhakra Nangal, many community development projects, minor irrigation schemes etc. And so to say this was the original sin in which the forbidden fruit was consumed by both the Center and States and there is no redemption thereafter. The authors correctly point out concerns on page 77 that “the most sensitive part of Centre-State fiscal relations is mainly the area of transfers outside the Finance Commission that is implicitly available to the Centre. The States feel that the magnitude of the transfer are large; their inter-state distribution is discretionary, arbitrary, and regressive; the transfers create multiplier responsibilities on them; that they distort the designs of the State schemes even if the later are better and more advanced; and above all, the entire credit is taken by the Central Government, whereas the schemes are jointly funded and implementation is done exclusively by the States.” What is the basis of the perpetuation of this original sin? The Central Government does not even transfer the subjects related to the CSS to the Concurrent list or have individual standalone legislations instead securing parliamentary power. For how long the misuse of the Article 282, totally outside the frames of the constitution, will continue to exist? This is the core question that creates dichotomy in the functions of the Finance Commission as envisaged in Article 280. How is this contradiction to be resolved? This requires wider debate. Finally a final comment is about the Triumph of Experience over Expectations. While justifying the 42% devolution recommended by the 14th Finance Commission on page 74 of the book the authors very correctly point out that tax devolutions of 42% recommended by the 14th Finance Commission is not comparable with devolution of 32% recommended by its immediate predecessor. The tax devolution the Commission recommended subsumed normal plan assistance, special plan assistance, special central assistance and also state-specific grants. In addition it did not recommend any sector-specific grants. In almost every state which we visited there was complaint by the States that in some ways funding mechanism to give back what they thought as lost money have been subsumed under the award of the Finance Commission. Going beyond this the rationalisation of the CSS and circumscribing the transfers outside the formal mechanism by recourse of Act 282 also remain more or less where it was prior to abolition of Planning Commission. The experience seem to have triumphed over expectations. I do not wish to comment too much on this except to say that it is the President’s prerogative to determine both the wording and the context of the TOR assigned to the Commission. And it is the prerogative of the Commission to address them in a manner that it considers appropriate. The Commission is not obliged to agree but the Commission is obliged to address the specific reference which have been made to it. In doing so we are inherently bound by past precedence and the contours of our constitutional obligations. I think Article 282 of the Constitution needs to be circumscribed and prescribed some conditions which can be invoked for undertaking schemes and measures which can undercut the basic functioning of the transfer mechanism through the Finance Commission. Indeed, in the history of the Finance Commission, the extra constitutional comfort of the Planning Commission in undertaking several of these transfers by recourse of art 282 is part of this original sin. We do not have a way forward. There are one or two other areas which the book has referred to where it is so to say, functionally work is in progress, namely in the terms of Cesses & surcharges becoming a disproportionate proportion of the overall divisible revenue, non-tax revenues being kept outside the divisible pool. These are no doubt worrisome issues because I too agree that there should be some mechanism to ensure that the basic spirit of the devolution process should not be undercut by clever financial engineering or taking recourse to traditions which makes them technical and legally tenable but perhaps morally not so.